This page has a short explanation, some examples, and a chance for you to practice them. The simple present tense is the way to talk about facts: what is always, sometimes, or never true or what happens over and over. It uses the base form of the verb (the infinitive without ‘to’) except in the third person singular. 3rd person singular (he, she, or it-- one person or thing) ends in -s.
For example, we say 'I study' or 'you study, but 'John studies.' Sally and Susan study too. The simple presemt usually adds -s or -es to the base form, except for the verb ‘to have,’ (he or she has), and the verb ‘to be,’ which uses ‘is.’ Negatives and questions normally use the helping verb ‘to do’ plus the base form of the main verb. See examples below. We use the present continuous tense to talk about something that is happening right now. (I’m typing; you’re reading; my husband is driving and my daughter is sleeping.) It is formed using the verb to be with the ‘ing’ form (present participle) of the main verb, as shown. · If you have questions about could, can, might, or similar helping verbs, see Modal Verbs. Choose the correct form (or forms) for each sentence and write your answers on a piece of paper. Example: 1. Joe (is, are) an athlete. 2. He (run, runs, is running) in every competition. 3. Every other Saturday Joe (have, has, is having) a track meet at school. 4. He usually (get, gets, is getting) up at 6 A.M., but even though it’s 5:30 A.M. right now he (get, gets, is getting) up for today’s race. Answers: 1. is. 2. runs. 3. has. 4. gets, is getting. (Explanation: The first sentences talk about something that is true-- Joe is a runner-- and things he does repeatedly. The last sentence talks about what he usually does, and then about what he is doing right now-- this time, rather than often or all the time. So the last ‘get’ is in the present continuous tense, because it’s going on now.) For the next answers see the link at the bottom of the page. 5. I (like, likes, am liking) to read. 6. Does Jim (like, likes, is liking) to study? 7. Every weekday morning at 8 A.M. Josh (go, goes, is going) to work. 8. Many mornings when I (wake, wakes, am waking) up, I (hear, hears, am hearing) the birds singing. 9. Sarah (take, takes, is taking) the bus to work often. 10. She (live, lives, is living) too far from her work to walk. 11. Do you (know, knows, are knowing) the time? 12. It’s 10:30. Are you (ask, asks, asking) because you don’t (have, has, is having) a watch? 13. No. I (have, has, am having) a watch, but I (have, has, am having) trouble seeing right now, after an eye exam. 14. Some high school students don’t even (try, tries, are trying) to answer questions in class. 15. For example, Bill (come, comes, is coming) to class every day, but he never (give, gives, is giving) the answer to the teacher’s questions. 16. He always (leave, leaves, is leaving) the moment the bell rings. 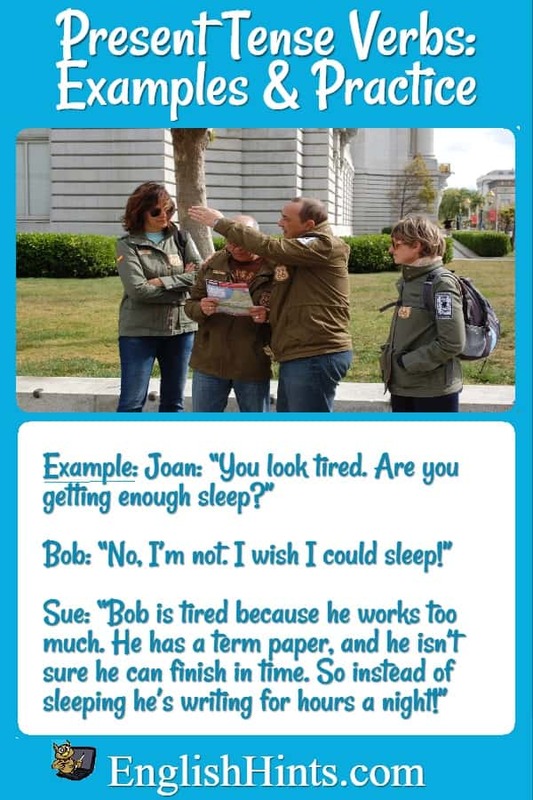 Click here for the answers to Present Tense Verbs. and others (plus more practice) on the English Verb Tenses page. Home> English Verb Tenses> Present Tense Verbs. 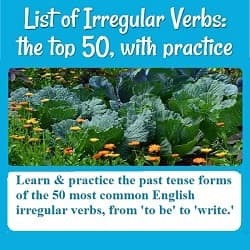 Learn a little about each of the different verb tenses in English (with links to more examples and practice. ).